This is not how Comcast wanted to end a week that saw it having to explain how a supposedly rogue employee could change a customer’s name to “A**hole Brown.” Other customers have since come forward claiming they also had their names tweaked for the worst by Comcast staffers. Once again the complaints come via journalist and consumer advocate Christopher Elliott’s blog, which first broke the news of the A**hole incident. As that story caught fire online, other Comcast customers reached out to Elliott with claims that their accounts were altered with offensive names. One customer’s bill added the word “Whore” to the name on her account. The woman, whose name is not “Whore,” said she had to speak with “at least 20” Comcast staffers over the course of several weeks before her account was finally fixed. She claims that no one offered an apology or explanation for how the name change occurred. 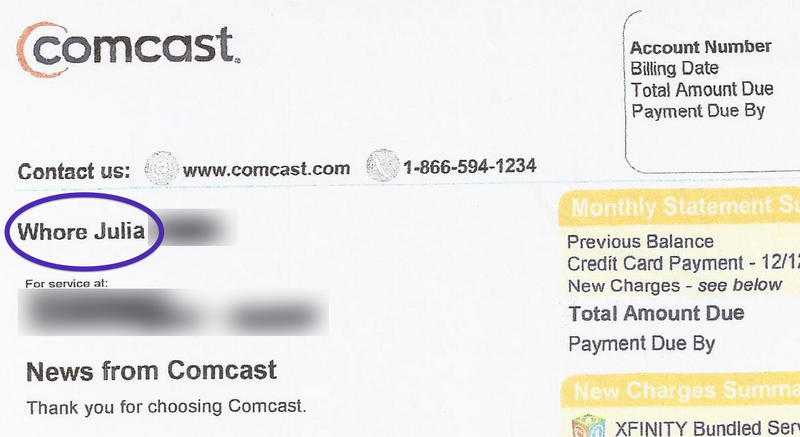 A third customer says that after his parents called Comcast to remove their phone and TV services from the account, the first name on the account was mysteriously changed to “Fakoe,” which in no way resembles the name previously on the account. “This ‘Fakoe’ name is nowhere near either of their monikers and seems to be an insult in the form of the F-word aimed towards my parents,” the customers’ kid explains. One former subcontractor for Comcast explains how it’s easy to make these name changes, but that it would have to be deliberate. We’ve contacted Comcast HQ for comment on this latest spate of insulting name-changes and will update when we hear anything back. Next Are Cable Companies Lowering HBO Rates In Advance Of Standalone HBO Go? Next Up: Are Cable Companies Lowering HBO Rates In Advance Of Standalone HBO Go?